So how do we solve these issues? By creating an actual connection. A TCP connection that is. These points requires two different mechanisms, so let’s look at the one by one. After the last step, the conversation is started. All of these step are necessary for us to know there is an actual conversation. Skipping one of them might make you think something is wrong. For instance, if part 2 doesn’t say ‘hello’, you might think there is something wrong with the connection. This number is then sent back from the recipient to confirm that “okay, so now I have every package up to this package” ( I will refer to the confirmation as ACK numbers.) So when we get an ACK for the last paackage we sent, we know that the other part has received everything we have sent so far. This means we don’t have to worry about any of the packages having been lost. But say the receiver misses a package in the middle? For example, what if the receiver gets package 1,2,4, but not 3? The receiver will look at the ACK numbers and think “huh… I’m missing a package here.” And will only send ACK 2 back. At this point, your application might get package 1 and 2, but not 4, since it’s out of order. Let’s look at an example to see how the TCP might handle loss of packages. Send ACK 1 all good so far! Uh oh! Where’s package 3? Receiver receives package 3, again! The original package 3 was just delayed get it again. Now the receiver has got all 4 packages and all is fine and dandy. But if you study the example, you see that in our case the sender has to resend 2 packages ( 3 and 4), while the receiver in reality only needed one ( 3 ) And in addition, we got package 3 twice. But even though we got package 4 early, it wasn’t sent to our application before we got package 3 because TCP we receive everything in order. This is one of the major drawback of TCP ; there can be lots of delays and re-sending of packages. A final issue about TCP performance is how it regulates package sending. TCP can send several packages at any time. The basic idea is that every time every package is sent successfully and in time, it’ll send more packages the next time. As you can see, TCP will try its best to keep sending the maximum number of packages without having to resend anything. Although TCP is quite old ( more than 30 years old, ) it’s really complicated. There are a lot of different mechanisms involved to deal with anything that might happen. Not only do they handle the cases we’ve seen, but it also, as we saw, needs to control the speed for optimal performance. The server is the part that all the clients will connect to. So the server will always be listening for new connection and accepting them as they come. The server will be accepting connections from any client, so we don’t specify IPs on their server side ( ,ore on this later. ) We will only specify the port to listen to. The client tries to connect to the server. It needs to know both the IP and port of the server before it can try to connect to the server. The server doesn’t know anything about the client until it tries to connect to the server. When the server accepts the client, the connection is established. At this point in time, the server also has a connection to that client specifically. We’ll see this later. Note that these are just different types of connection, not necessarily different computers. A computer can have any number of server and / or client connections. So now that we have all the technical information about TCP is out of the way, we can start setting up a TCP connection of our own. As you might expect, the source code for TCP is a bit more involved than the UDP one. This part relies on code from my previous post. If something is unclear, you can go back and read that part if you want more information. I have also added links to the documentation in the headers. IPaddress* address – a pointer to an allocated / created IPAdress. The int value 0 on success, otherwise -1. In this case, address.host will be INADDR_NONE. This can happen if the address is invalid or leads to nowhere. The server part needs to be listening for IPs that are trying to connect. So we’re not really resolving a host this time. We’re just preparing the IPaddress for the next step. For clients, this function is used more or less exactly like in the previous part ; it’ll prepare the IPaddress with the information we supply. Of course, the port on both the server and client side has to be the same. Note: no connections has been initiated yet, we’ve just asked SDL to prepare the port and IP address for us. This is a new type. It represents a TCP connection. We’ll use it just like UDPSocket but of course this time it represents a TCP connection instead of a UDP connection. Here is the function signature. Above we saw that if we call SDLNet_ResolveHost with null as the IP, SDL_net will set the IP of the to INADDR_NONE. This means we will be listening for connections, rather than trying to connect. This is because, as a server, we don’t actively try to connect to another host ( we just accept connections ), so we don’t know about any IP address yet. What this function does in this case, is that it tries to open the port for listening. Before we jump into the next part, let’s have a quick look at an example of how to use these two functions. These two functions are the initialization part of the TCP code. Since these steps are slightly different form client to server, I’ll cover them separately. // This sets the IPaddress up with the correct values. // In this case, 127.0.0.1 which basically means "this computer"
The clients are the parts you’ll be dealing with they most. A client communicates with other clients. This is more or less just like in UDP, but there are som differences. This function is quite straight ahead. The only thing to note is the void*. The type void* is something that is widely used in C but not so much in C++. It’s basically a pointer to anything. So the data can be just about any form of data. This requires a bit of low-level C “hacking” to get right. The number of bytes that was sent. If this is less than the size of the data we tried to send ( or the len parameter, ) an error has occured. This error could be the client disconnecting or a network error. // Cast our std::string to void* so that SDL_net can understand it properly // (Don't worry too much about this ) const char* charPtr = str.c_str(); void* messageData = const_cast< char* > ( charPtr ); int messageSize = str.length(); int bytesSent = bytesSent = SDLNet_TCP_Send( tcpSocket, messageData, messageSize); if ( bytesSent < messageSize ) // ERROR! SDLNet_TCP_Send sent less bytes than we wanted. // ERROR! SDLNet_TCP_Send sent less bytes than we wanted. The number of data received. If this is less than 0, an error has occured. And since this is C ( and not C++ ) we need to allocate a decent sized buffer in advance ( this is the void *date part. It’ll have the same size as maxlen. The setting of the buffer involves a little C-style trickery. // NOTE: Receiving data involves a little C style pointer manipulation. // I'll try to find a cleaner, less C-like way to do it. // Set the last character to '\0' which means "end of sting"
// We received 0 or less bytes. // This may mean an error hs occurred or the connection may have been closed. This is the essentially the accept part of the three-way handshake. The client has tried to connect to us and we need to accept it before the connection is established. This function does exactly what you might expect : it accepts an incoming TCP connection, informs the client and thus establishing the connection. TCPsocket *server – the TCPsocket* we use for listening for new connections. This is the TCPConnection we created using SDLNet_TCP_Open. A different TCPsocket this TCPsocket does represent a connection to a specific client. If it’s valid, it means a connection has been established. If it’s null it means no connection was established. This can mean that there was an error. But it can also mean that there was no clients trying to connect. There is a major issue with the receive function. It blocks. This means the function waits until it has received something. Actually, according to the documentation, it’ll wait til it has received exactly maxlen bytes and then set those in the void* data. But from what I’ve found, this isn’t 100% true. What I have found, is that the function will block. But only until it has received something ( at most maxlen bytes. ) So, in other words, it waits til it has received something, no matter how little or much it is. But even though this is better than waiting for maxlen bytes, the fact that it blocks is still an issue we’ll need to solve. This can ( and probably will ) happen if buffer size is large enough. That means there are two issues to fix : the fact that it blocks and the fact that we might not receive everything with one call to SDLNet_TCP_Recv. To solve this, we can check if something has happened on a collection of TCPsockets, this includes someone connecting, disconnecting or receiving data. We can use a SDLNet_SocketSet to solve this. Think of it as simply a set of sockets. We’ll be using it for storing and checking TCPsockets to see if there is any activity. A SDLNet_SocketSet can contain any number of TCPSockets. Those can be both server and client connections. This is a really simple function for adding a socket to a SDLNet_SocketSet. It also exists for UDP, but we’ll be using the TCP version, of course. The number of TCPsockets in the SDLNet_SocketSet on success. Or -1 on failure. Now that we’ve added sockets to the SDLNet_SocketSet, we can use the SDLNet_CheckSockets function to check for activity. “Activity” in this case basically means that something has happened. This can either mean we have received data, that someone has disconnected or that there is an error. Uint32 timeout – a variable stating how long ( in milliseconds ) we want to wait for activity. We can wait anything between 0 milliseconds and… well anything up to 49 days. The number of TCPsockets in the SDLNet_SocketSet with activity on success. Or -1 if either theSDLNet_SocketSet is empty or there was an error. After we’ve called SDLNet_CheckSockets, we can use this function to check whether a particular TCPSocket has been marked as active. This function should be called on a socket on a SDLNet_SocketSet after code>SDLNet_CheckSockets has been called on the SocketSet that holds that TCPSocket. In other words ; we use SDLNet_CheckSockets to see if any of the TCPSockets in a SDLNet_SocketSet has any activity. If so, we can call SDLNet_SocketReady on each of the SDLNet_SocketSets in that SDLNet_SocketSet to see if that TCPSocket in particular has any activity. Now let’s look at how you could implement an update function that checks for activity. They’ll be different for server and client connections since client connections checks for incoming messages and disconnections. While on the server side we’ll simply check for clients trying to connect. A problem that arises here, is that calling code>SDLNet_CheckSockets kind of sets the TCPSocket back to “inactive” when you call it. Even if there is several messages waiting to be read. So when you have called ReadMessage(), you have no way of knowing if it has any more data. Calling it again, would mean calling SDLNet_TCP_Recv again which could block until the other client sent more data. // Now we know that there is a connection waiting for us, so let's accept it! I think that’s all for now. You can find a working implementation here. Setting up a TCP connection using SDL_Net is quite tricky. Lots of tutorials out there just briefly discuss the topic without going into much detail about the different functions. Hopefully this post has helped you get a better view of the different parts of SDL_net ( I sure did writing it! ) I might also post a third networking post about an even better way of doing network communication using both UDP and TCP for maximum performance. A huge aspect of game programming is multiplayer. A huge share of all the popular video games today support internet in sme ways. But this introduces several new challanges. Both in the communciation over internet itself but also in what data to send, how to react to data and how to make everything synchronized. This is going to be a sub series in itself starting off with how to do the actual communication. When you’re sending something over the Internet, it’ll get split into quite small packages. Each of these packages are usually a few kilobytes or smaller. There are actually several types of packages which get wrapped in each other. I won’t get into the details of this, but what we need to know is that there are several types of packets and they get wrapped in each other. 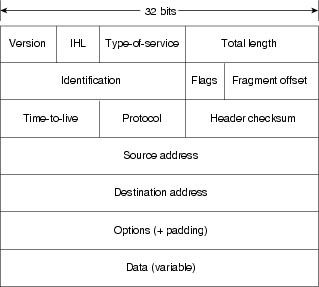 One of the basic packet types is the IP ( Internet Protocol ) packet. You can look at this as the package that leaves our computer and is sent out on the Internet. Every package that is sent across the Internet is of this type. We won’t go into the details of each of these fields, the image is there just to show you how it looks. I might go into the details on a later point in time, but that is a big topic and we don’t really need to know all of that in order to do multiplayer. The package is then sent out on the Internet and will eventually find its way to its destination PC. This is similar to sending a letter. You put the letter inside an envelope and write the destination address on it. Then the mail carrier will take care of the rest. Actually, that isn’t entirely true because there is another step before the package leaves your computer; we need a protocol. Above we saw an example of in IP package. So now that we know about packages, the next topic is protocol. A protocol is basically a set of rules about how the two parts should communicate. Most important to us, these rules dictate how to detect package loss and how to deal with them. Why do we need protocols? Most of the times when you send something, everything goes fine and the recipient gets the data packages he need. But things can go wrong. Let’s take an example. Say we have sent our letter to someone. But on it’s way, the letter gets lost. But how can we know? The mail carrier doesn’t know that the letter is lost. The recipient doesn’t know you’ve sent the letter and you yourself is assuming the letter arrived at its destination without any issues. The exact same thing could happen on the Internet ; packages can get lost, and none will know. So how can the problem be avoided? This is where protocols come in! There are two protocols, we’ll cover, TCP and UDP. This time, I’ll only cover UDP. I’ll cover the other one, TCP, in a later post. The most basic of the protocols we’ll look at is UDP ( User Datagram Protocol. ) Actually, UDP is so basic, there is no rules about how to deal with package loss. You have to handle that yourself. Another issue is that there is no guarantee that the packages will be received in order. So you could get packages 1,2,3 as 3,2,1 or 3,1,2 or 2,3,1 etc.. And that’s if you do get all packages. Needless to say, using UDP can cause lots of problems. But its’ simple so we’ll start with it. On the Internet, there are two units used for addressing, the IP address and the port number. We need both of these to communicate over the Internet. The IP address is used to address computer. Every unit on the Internet has an IP address that refers to that unit. You can look at it as the address of a house. So when you send a letter to someone in a house, you write the address to that house. When you send a packet to a computer, you send a packet to that IP address. Port numbers are used to distinguish between connections. Each connection has a separate port number tied to it. If we didn’t have port numbers, all data would go into a large buffer and you’d have no idea which of these datas where yours. So if an IP adress refers to a house, a port could be looked at as a name. Actually, UDP is not really a connection, it’s just two parts sending data back and fort. But both parts still needs to know both IP and port number of each other. And it is common and more practical to think about it as an actual connection. There are two roles in a UDP “connection”. We’ll be using sockets as a unit to keep track of a connection. You can look at scokets to the sockets you plug your electric devices to. Following that analogy, the wire would be the connection ( network cable ). So, in essence, it’s what connects your application to the Internet. I realize this all might be a lot of information and hard to wrap your hand around it all, but it’ll get clearer when we put it to use. Now that we know a tiny bit about UDP connections, let’s try to set up one ourselves. For that purpose, we need the SDL_net library. It is capable of setting up and maintaining both UDP and TCP connections. Since UDP connections are way simpler, we’ll only cover that for now. If you can’t find SDL2_net in any repositories and it’s not installed by default, you might have to compile it yourself. For more information, see my blog post about setting up SDL2. Setting up a connection with SDL_net is a bit more complicated than what we’ve previously seen. This is because there are a few steps, the code will be very C ( not C++ ) and there are some buffers ( raw arrays ) we need to keep track off. We’ll be cutting out all GUI because we simply don’t need it. It will make our code shorter and it’ll be easier to display the results. SDL_net contains two parts we need for out UDP connection. Let’s start with the simplest, IPAddress. It is used for keeping IP and port number together. Some functins takes this as one of the parameters. A pointer to a data type that holds to a pointer. Since it a pointer, it can be NULL, in which case there is no connection and we can’t send data back and forth. Our data packet. Contains the data we are sending back and forth along with some other information. For received packages this is the IP / port of the remote part. For sent packages this is the IP / port to send to. The various fields of a UDP packet is set with various function used for sending and receiving data. It might seem confusing right now, but it’ll get clearer once we get into the actual code. This function is used for creating a socket which we will use later to send data. Uint16 port – the port we want to use. If you use 0, SDL_Net will assign a port for you. A valid UDPsocket, NULL on error. Remember that UDPSocket is a pointer. As we saw earlier, UDP isn’t actually a connection. All we are doing is sending data back and forth. And all we need to do that is a socket. Now that we’ve opened this socket, we can start dealing with packages. As stated before, we need an IP address and port number in order to send data. The problem is that there are several ways to represent IP addresses and port numbers. The difference between them is the order in which the they are converted to binary. These orders are refereed to as little endian and big endian I won’t dive more into this, but you can read about it here. The issue is that different system use different endian. So we need a uniform way of setting the IP address and port number. This is where SDLNet_ResolveHost comes in. What it does, is that it sets the name values of an IPAdress for us so we don’t have to think about endians at all. Allocates a UDP_Packet and returns a pointer to it. int size – size of the packet in bytes. 0 is invalid. The size of the packet determines how much data we get every time. It’ll never be more than this size, but it can be less. You can also expect that some packages gets mfSerged or split up into different segments. This is something we’ll need to handle. After allocation space for a packet, we can finally fill that packet up with something. Which is kinda the point of this ordeal. In our case, the function should always return 1 but I find it better to just check for 0. Now that we know how to send data, we also need to know how to recieve them. The int value 1 when a packet is received, 0 when no packets where received, and -1 on errors. To make it simpler to use SDL_Net, I’ve made a helper class that takes care of everything. You’ll find an example at how to use it below. To use the example, you need two instance of the application. So start up two instances of it. You’ll be asked to enter local IP. This is the IP of the computer you are sitting on. You can use 127.0.0.1 which simply means “this computer”. You can do this in both instances. You’ll also be asked to enter a local port and remote port. These needs to be opposite on the two instances ; the local port of the first one, needs to be the remote port of the other. This is because we need to know where to send it to and where to listen for data on. UDP connection - A simple test for UDP connections using SDL_Net! And now you should be able to set up connections. Feel free to use the UDPConnection struct as you like.